What's in Your Story's Mind? Why a "Story Mind" ? Main Character "Approach" - Do-er or Be-er? Main Character "Growth" - Start or Stop? Main Character "Resolve" - Change or Steadfast? Main Character "Style" - Logic or Intuition? A Constructive Criticism of "True Lies"
Tricking the Muse: the Creativity "Two-Step"
What is the Worst Part of Writing for You Personally? What is the Best Way for a New User to Approach Dramatica? Do Dramatica’s Specific Questions Limit Story Richness? Does Dramatica Limit Your Story? What Does Dramatica Mean by the Word Illustrate? Where to Start - Story Engine, Theme Browser, Query System? Dramatica: Where'd the Idea Come From? Is "Objective" Character the Same As "Obstacle" Character? Yes, but is it a Plot? What's in Acts One, Two and Three? Story "Driver" - Action or Decision? Story "Judgment" - Good or Bad? Story "Limit" - Time Lock or Option Lock? Story "Outcome" - Success or Failure? Step 1 What's the Big Idea? Step 3 No Ideas At All? Geesh! Okay, Try THIS! 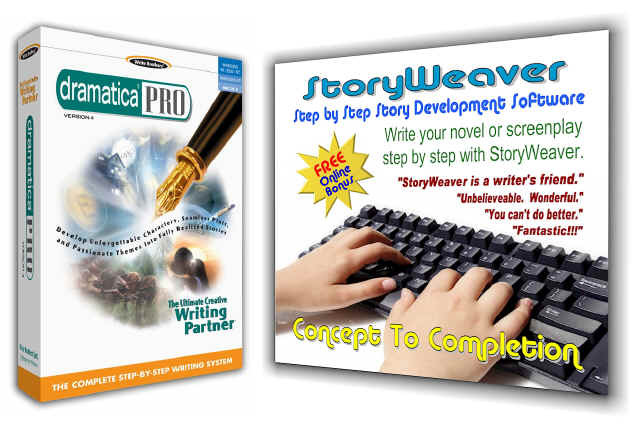 Each monthly issue is packed with new articles and streaming videos on all aspects of story structure and storytelling, including our continuing series, Write Your Novel or Screenplay Step-by-Step. Learn all about characters, plot, theme and genre - how they work, how to write them. Discover tips, tricks, and techniques for finding inspiration, overcoming writer's block and for putting passion into your work. Join more than 16,000 subscribers and get the very best information on story development and the writing craft, special discounts on our products, and advance notifications of updates, upgrades and events.